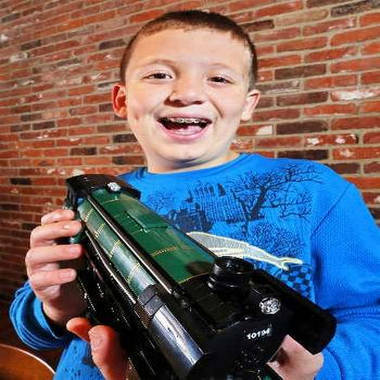 James Groccia, 11, saved for two years for a LEGO train, but by then the company had stopped making it. The company was so moved by his story that they sent him the set. James Groccia has loved LEGO since he was about 4 years old. But when the little boy told his parents a couple of years ago that he wanted the $100 Emerald Night Train set, which had more than 1,000 pieces, they hesitated before making the big purchase. After all, the set was meant for 14-year-olds and they worried that James, who was 8 or 9 at the time, wouldn’t be able to put it together. “We didn’t want to just go out and get him something that could have been too complex for him,” James’s dad, Jay Groccia, told TODAY. The couple, who live in Boylston, Mass., also saw one of those golden parenting opportunities to teach their oldest child about responsibility. “My wife just basically said, ‘If it’s something you really want, save up for it,” Groccia said. James, who has a form of autism called Asperger’s syndrome, did just that. It took him about two years to save up the $100. And then, disaster struck. LEGO had stopped making the train set. The collector items were pricey – around $250 in some cases – and Groccia also worried that the used sets they could find online would have missing pieces. Still, the couple felt so bad for their little boy that they were even considering purchasing the pricey sets, or buying the hundreds of pieces individually. James, who was by then 10, couldn’t get the Emerald Night Train set out of his head. Finally, with his mother’s help, he wrote a letter to LEGO explaining his situation. It was the kind of letter that would break any parent’s heart, and yet also make them so proud. In it, he told the LEGO company about how much he loves their toys, and how he even uses them in a play group designed to help kids with autism build social skills. And he told them how much the Emerald Night set meant to him. At first, LEGO said they could not help James. But then a package showed up at the family's door. It happened to be right around James’ 11th birthday. In an e-mail to TODAY, LEGO confirmed that they had sent the Emerald Night Train set to James. Michael McNally, the company’s brand relations director, said in the email that the company was humbled by the family’s decision to share the company’s gesture, which he noted is not a regular company practice. As for James, his dad says that after he opened the box he still had to do his regular chores before dinner. He was able to work on the train that night, and he was up at 5:30 a.m. the next morning to work on it again. For Christmas this year, James is asking for the train track to go with the Emerald Night set. His dad expects it’s far from the last LEGO set his son will ask for.